The show itself, consisting of twelve solid indie-folk cuts, had nary a "horse feather" (term defined similarly to tomfoolery), except for some onstage banter. Lead Singer/ guitarist Justin Ringle couldn't hear himself through the onstage monitor and said, "It feels like I'm doing this blindly. That's just scary." Several folks responded that, regardless, it sounded excellent, so Ringle said, "I guess it's just part of the job, huh?" Multi-instrumentalist Sam Cooper told me after the show, normally, they don't banter much, this was an exception. 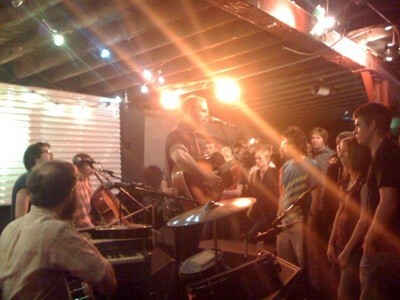 The band's musical sensibilities were exceptional and the sound, more than other shows at Kilby, was precise—however, they could have easily performed unplugged and sounded impeccable—the elongated notes and strums bouncing off garage-like walls, reverberating with a folksy echo. 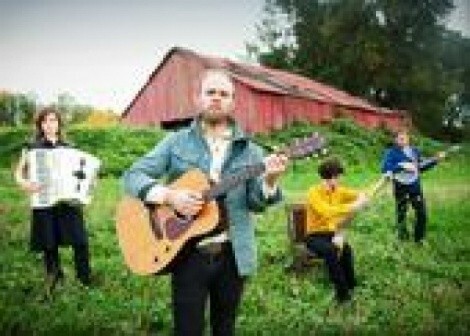 The band, in years past mainly consisting of Ringle and Peter Broderick (of Norfolk & Western) has been releasing albums since 2006, but just expanded to a foursome in the past two. Broderick is out, living in Europe, and in his steed sits Nathan Crocket on violin, Catherine Odell on viola and the aforementioned Cooper. Since, they've been touring like crazy, honing their live performance (they don't use a setlist it's so tight). It shows, for their music live is even more captivating than their albums, including their latest Thistled Spring (2010, Kill Rock Stars)—that's not to say I haven't been listening to it consistently for several weeks. It's that, over house speakers, it makes great background music, but in concert it captures the listener, rapping them in a Porlandia musical fog like a warm blanket on a rainy day. The banjo-led "Working Poor" and then "Dust Bowl" opened the set and began the outpour of beautiful sound. The band oscillated nicely between selections from all three of their albums. Next came "Belly of June" and "Cascades" from Thistled Spring. Regardless of monitor woes, Ringle's mumbly words spilled out and onto each song in a woodsy, heartfelt slowed-down manner. Sure, there's hints of other current folky bands but equipped with cello and violin, the Bon Iver is hard-pressed, and the string plucking is even slower than Iron & Wine. They definitely carve their own little niche in the acoustic realm. Other highlights included "Finch on Saturday," "Curs in the Weeds" "Starving Robin's." Crocket played the saw for the set ending "Heathen's Kiss," which was a real treat. The encore was Gillian Welch's "Orphan Girl," with harmonies without mics—truly stunning. One of the great virtues of Kilby Court's great virtues is that bands are essentially forced to mingle: there's no hiding in the green room because it's right off the courtyard and the loading zone is next to the front entrance. So, the Horse Feathers troupe accepted their due compliments from a happy audience and chatted about touring, songs, etc. for awhile afterwards, demonstrating that their humility and congeniality extends beyond their music.